Appealing Architecture, Optimum Space and Best Quality Construction. An Enviable Location close to basic amenities like School, College, Hospital, Super Markets, and places of worship. VIJAYA Apartments is located at Lobo Lane, Mallikatta, Mangalore, one of the most sought after residential localities in Mangalore with huge potential for value appreciation for your investment. This is a prominent location within reach of St. Agnes School & College, Kadri Market, Kanara Club, More Department Store, City Hospital, Tejaswini Hospital, Kadri Temple, Eden Club and National Highway – 17. Consider the advantages that you have Appealing Architecture, Optimum Space, an Enviable Location, Best Quality Construction, all backed by the rock solid reputation of Land Trades, promoters and developers whose very name spells success. An elegant six storey structure with beautifully designed frontage and exquisitely planned interiors, the apartment is easily accessible with broad roads and bears close proximity to public transport too. The project comprises of 18 ultra-spacious three bedroom apartments, available in a choice of 1130 Sq Ft to 2115 Sq Ft areas. Each apartment is thoughtfully designed to facilitate best use of available space, natural light and ventilation. Apt placement of bedrooms, bathrooms and kitchen as also the use of best quality construction materials, fittings and fixtures makes each house a pleasure to line in. Two & Three bedrooms apartments available in various built up areas. * 2 bedrooms apartments – 1130 Sq. Ft.
* 2 bedrooms apartments – 1295 Sq. Ft.
* 3 bedrooms apartments – 1750 Sq. Ft.
* 3 bedrooms apartments – 1895 Sq. Ft.
* 3 bedrooms apartments – 1995 Sq. Ft.
* 3 bedrooms apartments – 2115 Sq. Ft.
* Fully R.C.C Framed structure. 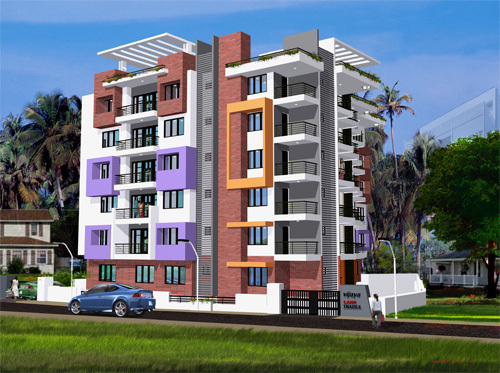 This entry was posted in Property and tagged Land Trades, Lobo Lane, Mallikatta, Mangalore, new apartments, new flats, Vijaya Apartments. Bookmark the permalink.